Easy to Learn Korean 897 – Expressions: A Slikworm’s Wrinkles. 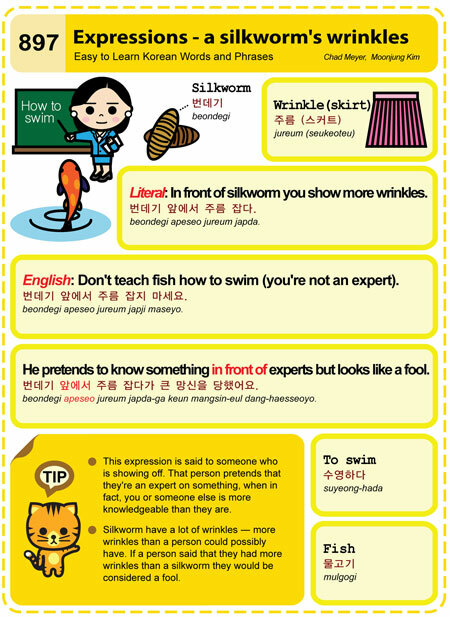 This entry was posted in Series and tagged expert, pretend, silkworm, teach a fish how to swim, wrinkle, 물고기, 번데기, 번데기 앞에서 주름 잡다, 번데기 앞에서 주름 잡다가 큰 망신을 당했어요, 번데기 앞에서 주름 잡지 마세요, 수영하다, 주름 by easykorean. Bookmark the permalink.